New meta study increase our level of confidence in dental implants - according to a report in Medical News today (Aug 2013). This report talks about a 3 year international study where only one implant was lost out of 106 placed over the three year period. Long term studies of any type are difficult to complete and in the every changing world of implants we like to keep up with the findings from around the world. Of course every mouth and situation is different. For this reason the Dental Board of Australia does require us to warn you that having an implant is a surgical procedure and hence involves risks. How much will implants cost? Keeping our teeth for life is the 'aim of our game.' Unfortunately sometimes we loose an important tooth. Today we can look at a few different options to replacing teeth and restoring appearance and functionality. The closest artificial replacement to a real tooth is a dental implant. A dental implant is a small metal screw or post that replaces the root portion of a missing natural tooth. A replacement crown is attached to the bonded implant so the dental implant looks and functions like a natural tooth. Sometimes a few implants may be used in conjunction with a denture to give greater stability to the denture. In some cases the alternative to a dental implant is bridgework. With bridgework an artificial tooth is attached to the surrounding teeth. Where bridgework is used some aspect of just one of the supporting teeth may cause failure of the whole structure, whereas with dental implants each tooth can stand on its own merits. Your dental and general health will be carefully evaluated before you have a dental implant. Depending on the area of tooth loss and the amount of bone missing, when a tooth is not present we can discuss whether this is an option for you to consider. Successful joining of the bone and the implant requires good periodontal health so if you have a higher risk of getting gum disease, e.g. diabetic, you may not be a good candidate for a dental implant. You must also be committed to great oral hygiene to help keep the supporting bone healthy. You may have friends who report they had a metal post placed or screwed into the bone and yet they report the cost to be a lot less than what we will quote you. This may not be a dental implant. It may be a post/crown where the natural root remains in the bone. This treatment is quite different. A dental implant involves surgery. This may be done by the dentist or a specialist. It may involve two stage surgery (surgery on two separate visits) or a single visit. This should not be painful, although there may be some post surgery discomfort which will be managed with pain killers. 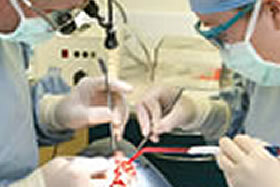 An anesthetic with sedation may be used at the time of the initial surgery. In most cases a temporary tooth or appliance will be placed in your mouth until the implant and crown are completed. NOTE: The Dental Board of Australia requires us to have the following warning about any surgical or invasive procedure because they carries risks.We value the opportunity to explain the risks to you. Warning: Before proceeding, you should seek a second opinion from an appropriately qualified health practitioner. Implants are generally slightly more expensive than bridges. You will not necessarily need an implant for every tooth you have lost. We really need to see you to look at what would be most suitable for your mouth. Dental bridges supported by implants have been shown to last over 15 years in 90 % of cases. The first "modern" implant was placed in a patients mouth in about 1965. Techniques and materials are still constantly improving in this field.